It’s well known that a picture says more than a thousand words. Fortunately, a GIF can say way more! So here’s your guide to GIFs in social media marketing campaigns. While there is much discussion about how to pronounce GIF — With a hard G, always! Fight me! —, the animated pictures have certainly become an integral part of internet culture. They’re beloved on Twitter, communication tools like Slack, as well as over email. It’s even become perfectly acceptable for brands to use GIFs in their own social media post, newsletters or blog posts. In 2016, 74% of social media marketers asked by Social Media Examiner [link opens PDF] said they were using visual assets in their social media marketing — and 60% said they were using video content. What do GIFs have on static images and video? GIFs are a great mix of “classic” visual content like images and videos, combining the best of both content forms. Like photos, they are quick to consume and easy to digest, and like videos, GIFs are eye-catchers because there is movement involved. At the same time, GIFs surpass static photos in that they can express more than just one photo can. And they eclipse videos because they’re shorter, don’t require sound and ask less time and attention from readers. They also take up less space in file size and don’t rely on things like a Flash player being installed. Furthermore, GIFs are now well-embeddable and native — and even autoplay — on most platforms and they’re mobile-friendly. GIF stands for Graphics Interchange Format. A GIF is an image file, like JPG or PNG, but can contain moving images. In June 2017, the GIF will turn 30. It was invented in 1987 by Steve Wilhite while working at CompuServe. Animation capabilities were added to an enhanced version in 1989. Early on, GIFs looked like this and like this. The genre got a lot of side-eye for a long time but in about 2005–08 millennials started embracing the GIF, making it an unmissable part of digital culture. In 2012, the Oxford Dictionary named GIF the Word of the Year. One reason GIFs are so popular is because of the manifold ways they can be deployed. We use them to add meaning to something written or as “reaction GIFs”, to express physical or emotional responses to something that has been posted, for example when words just won’t do. GIFs can be just an excerpt from a video — say from TV series, a film or another (pop)-culturally relevant moment. 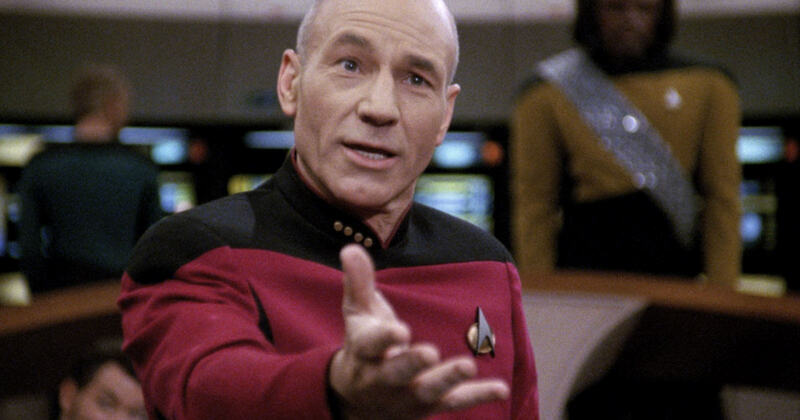 Sometimes they’re subtitled with the original dialogue, other times they evolve into GIF memes and get captioned and infused with new meaning, like this Star Trek GIF. GIFs can add meaning to written content in two ways. On one hand, a GIF makes a clearly visible joke tied directly to the content it’s used with. But it can also infuse more meaning based on the source the GIF is from. When connected to pop culture, GIFs also serve as a way to build off of a common baseline and create a sense of community. The use of a GIF can add meaning to the words in a tweet and connect like-minded people, creating rapport. Even if people don’t understand the reference, a GIF can still be funny. But there’s even more enjoyment in it if you do know the source. But GIFs aren’t just used humorously. They can also transport meaning. Educational GIFs are used to visualise concepts that can not as easily be explained with words alone. They’re often designed from scratch, making use of video, static images or writing to transport complex meanings. Educational GIFs can be drawings and illustrations or even slow-motion videos to explain scientific concepts, how things work or even to teach people sign language. People also create GIFs from screencasts, for example for use in tutorials or documentation materials, to include a snippet of a long webinar in a blog post, etc. GIFs can even help people feel calmer in stressful situations or when they’re having an anxiety attack. GIFs have definitely become mainstream enough to be used by brands. You might not regularly get a newsletter from your accountant with GIFs in it, but plenty of companies, big and small, have started putting GIFs in newsletters, social media posts, blog posts, etc. and some media outlets, like Buzzfeed, have even built a huge part of their identity around GIFs. Coca-Cola and Disney have Tumblr pages dedicated to their self-produced GIFs, and NASA even creates its own educational GIFs. But plenty of brands also use reaction GIFs in their communication, and Netflix has created an outdoor advertising campaign based solely on the art of the reaction GIFs. Brands using GIFs are walking a fine line. It’s important not to overuse the format and to use them in context. There’s always the danger of looking absolutely dated by trying too hard to look cool! It’s important to note that GIFs can easily lose their original context which can become problematic. For example, it’s easy to forget that Kimberly “Sweet Brown” Wilkins’ catchphrase “Ain’t nobody got time for that” was originally said by her in an interview done with her after she escaped a fire in an apartment complex. Furthermore, the use of the line has been criticised as mainstream appropriation of black slang and, consequently, black erasure. Another problem that can come up with GIFs is the issue of copyright. Since many reaction GIFs are created from copyrighted material like TV shows and films, this brings up the question whether GIFs themselves are copyrighted. There is a lot of back and forth of this since there haven’t been any clear precedents, but in U.S. law, the Fair Use doctrine should technically offer protection for creators and users of GIFs. People have argued that the use of GIFs could be a modern equivalent to kids taping magazine photos to their walls. However, the NFL, for example, has already sent take-down requests to Twitter for GIFs using NFL footage. In Europe, the situation is even less clear. In 2014, the European Court of Justice ruled that embedding a video on a website isn’t a copyright infringement if the video is widely available. But it’s in the nature of the internet that something that is widely available may still be very well infringing on copyright, which makes the whole thing a bit more complicated. With GIFs, it gets even more complicated. For one, it’s up to EU member states how they implement EU law. So while it can be argued that GIFs don’t infringe copyright in the UK, it might still count as an infringement in France or Italy. I guess it doesn’t help that there’s not exactly a logical place in GIFs to acknowledge authorship. So it’s probably safe to say that nothing is safe to say and that companies, especially, should think long and hard about whether and how they want to use GIFs. Not necessarily to decide against using GIFs, but to simply know the implications and legal situation, and to keep on top of this ever-evolving topic. For example, Mozilla is currently campaigning against the digital copyrights reforms proposed by the European Commission. The company has released various video clips showing how ridiculous the effects of some of the proposed changes could be for the digital space. Let’s say you’ve thought long and hard about it and have decided you want to use GIFs as part of your marketing. Now, where do you get them? One of the major and most well-known sources for GIFs is Giphy, a search engine dedicated to GIFs alone. The clips are sourced via an algorithm (and combed by human editors), uploaded by users, but also produced in-house at Giphy. Giphy also advises big brands on GIF strategy and even produces GIFs for customers like McDonald’s, Nike or Paramount in its own L.A. studio. Last year, Giphy launched Giphy Keys, a new keyboard app for phones that lets users seamless incorporate GIFs into all of their communication. Giphy is now also directly integrated with Facebook Messenger and Twitter, as well as Slack and many other tools and apps, including a Giphy Chrome Extension for Gmail users. Of course, you can always use Google to find GIFs as well, simply by image googling and then selecting “Animated” from the image type dropdown. I’ve found this to work well for me when I’m looking for something very specific where the Giphy tags might not correspond with the way I’m searching. Nonetheless, I have sometimes simply not been able to find the GIF I was looking for. For example, when I was working on the Gilmore Girls GIFs post last year I knew I wanted a GIF of Lorelei saying “the house is going through a tunnel” when on the phone with Rory, but I just couldn’t find that anywhere as a GIF. Fortunately, making one myself was pretty simple. 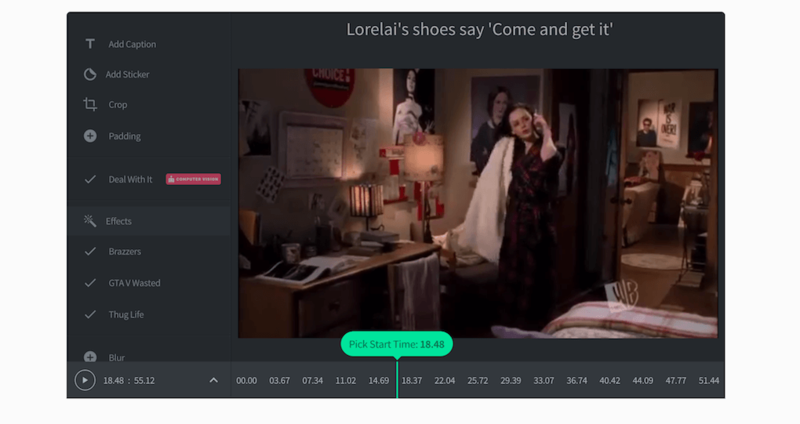 If you know you want a specific scene from a video, but you just can’t find the GIF in the many databases, you can create that GIF yourself using one of the many GIF makers available online. My favourite so far has been the one provided by gifs.com, as it’s so ridiculously simple to use and I find it more user-friendly than the one Giphy offers. All you have to do is find the scene or clip you’re looking for on YouTube and grab the link. It also works with Facebook, Vine or Instagram, though gifs.com does seem to struggle with Vimeo links at the moment. Or you can upload a video from your computer or phone. Paste the link or press upload, then use the various options to turn the video into a GIF. Pick a start and end time using the slider, crop and pad the GIF as needed. Then add captions, stickers and effects. When you’re done, create your GIF and decide whether you want to make it public or keep it private. You can also give it a title and tag it so other users can more easily find it or simply download the GIF to your computer, grab an embed code, etc. Of course, if you’re looking for more basic GIF editing options and don’t want to futz around with multiple tools, you can always use Giphy’s built-in tool to add captions, stickers, filters etc. Giphy also lets you create animated GIF slideshows. To reduce the file size of a GIF, perhaps because you’re using it in Mailchimp where file size is limited, you could try this GIF optimizer — just remember that reducing file size can be a bit of a trial and error process. If you’re looking to turn screencasts into GIFs, check out Recordit which has GIF support. what is your favourite or most used reaction GIF of all times? Comment here or tweet your GIF at us, whatever, just do it. We want to see them all.